Pukalani, Maui - Several friends suggested that I check out a Maui Farmer’s Union Meeting, something that I had been interested in, but had never managed to attend. I also don’t see myself as a farmer, unless weeds count. The meeting was not just for farmers but for anyone interested in local produce, eating good food, learning about sustainability, and sharing gardening knowledge. Non-members can attend as well, and one can join for a modest membership fee. There are also some gardening items, like bio-char and fertilizer, available as well as a produce/plant swap. It was surprisingly entertaining, especially the produce presentation. The meetings are currently held the last Tuesday of each month at the Pukalani Community Center, across Foodland, in the same building as the swimming pool. Socializing starts at 6 pm, and there is an abundant potluck that starts at 6:30 pm. There is a suggested donation if you eat but do not bring a potluck dish to share. I took several video clips of just a few highlights. There may be some better videos out there, and I'll be happy to replace these with less shaky, cleaner footage later on. Jason Skandunas of Tribe Café in Haiku talked briefly about macrobiotics and provided suggestions for eating in a macrobiotic way on Maui. He mentioned that Maui as an island is yang, so one can balance that energy by eating yin foods including avocados, bananas, mangoes, and various tropical fruits. Yum. Ryan at Mana Foods gave a short presentation on how to cut a jackfruit. Seeds are like a chestnut, and can be eaten raw if you get the sheath off. There are inferior jackfruit varieties, so if it doesn’t taste great, try another jackfruit. There was also a presentation on bokashi and effective microorganisms by Jenna Tallman, school garden coordinator at Haiku Elementary School. Vince Mina talked about strategic planning and Harriet Witt talked about the night sky in relation to farming. Lehuahana Vander Velde shared her work on creating the Maui Farmer’s Union website. Lehua is asking for more pictures and feedback. The meeting was definitely worthwhile, even if you don’t consider yourself a farmer. When you’ve given up trying to deal with termites by yourself, then it’s time to call the professionals. The traditional termite treatment, as mentioned in an earlier termite post, is to have your jungalow tented. Yes, as silly as it looks, some pest control company will put a huge tent over your jungalow and pump it full of poisonous gas, let it sit overnight, and then remove it the next day. Even Charley's restaurant in Paia was covered with a big termite tent in August. Yes, a big silly striped termite tent. This photo was taken of a house in Pukalani. Let's start with the basics. You probably already know that pineapples don't grow on trees. They are bromeliads, with spiky leaves radiating from a center. They are also very easy to grow, even in a pot, and can tolerate being in a jar filled with water for a long time. All you need to start with is a pineapple that still has its crown. Just go to a grocery store or a farmer's market and get one. A good pineapple to obtain is a Maui pineapple - they are hybridized to be really sweet, super-juicy, and low in acidity. If you are not on Maui, do your best to get a sweet variety. Your basic pineapple top, a little dried-out. First, grab the pineapple with one hand, and firmly twist the crown off with the other hand. It will come off fairly easily. There should be no need to cut it off unless you prefer. You now have a pineapple without a crown, without any damage to the fruit itself. Take the crown and pull off the lower leaves. You don't need them and they will get in the way of rooting the pineapple. Pull enough leaves to expose about an inch or more of core/stem. You may even see little rootlets around the ridged core. Pull off lower leaves to expose the ridged core underneath. If you have a pineapple top that someone else has cut off and it's a bit dried out, don't despair. Just trim off the lower leaves, and cut excess portions of the core, usually the bottom where it was attached to the fruit. You'll know they are excess parts because they are juicy and softer rather than firm. You want to expose the central core that has little ridges on the surface. You don't want fruit stuck to the core because when you put it in water, it will make everything rot. Even if the leaves are browned, if it's not more than a week, the pineapple top still has a good chance of rooting. Notice the ridges of the core, and the exposed root nodules (little bumps). The only top you will have no luck with is when the crown is sliced vertically in half. This is sometimes how pineapples are displayed at luaus, since it's decorative. Fill a jar with water and plop your crown into the jar. 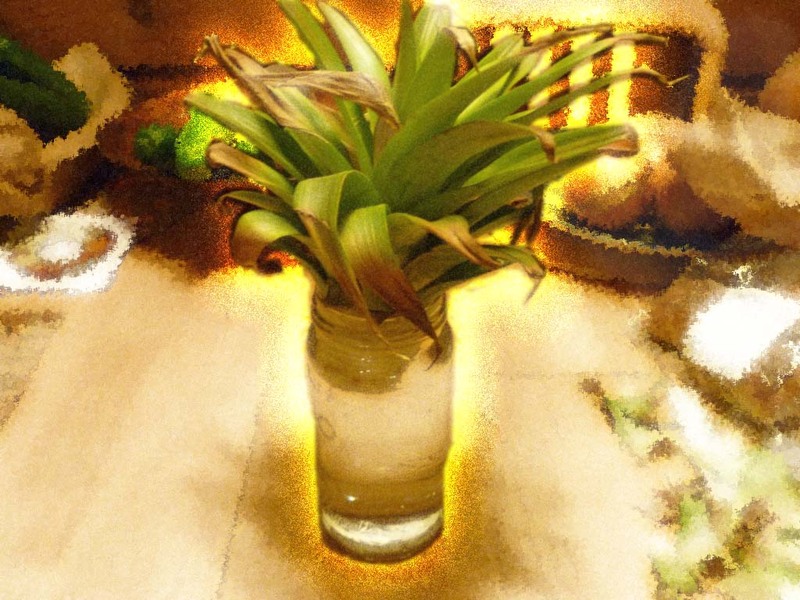 Place your pineapple jar in an area that gets decent light, although it can tolerate some shade. Refill the jar as needed - check every couple of days to make sure the crown is still submerged. Within only a few days, roots will emerge. Within two weeks, some nice roots should develop. With time, the pineapple leaves will also get longer and bigger. So make sure not to keep the jar somewhere that will poke you. Also, it's good to change the water, clean the jar occasionally, and wash off any green algae on the roots. After a few days, baby roots are forming. You can plant the pineapple whenever you're ready. I use basic potting mix or sometimes the heavy clay soil from the backyard with some compost added and that has worked fine. If you want fruit, you'll want to keep it in a sunny location. Otherwise, the pineapple will develop long slender leaves but will not fruit. After a week or so, long roots are growing. 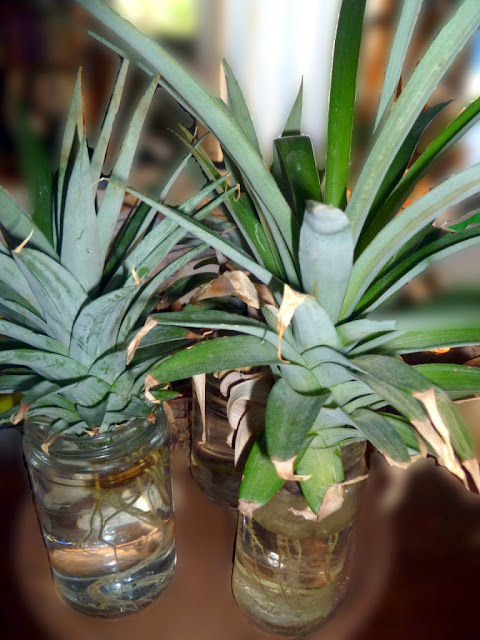 If you're not ready to plant your pineapple, because you don't have enough space or live in a place that gets cold in the winter, you could keep it in water for a long time. How long can you keep a pineapple in a jar? At least a year, perhaps longer. I've never paid a lot of attention, but they seem pretty hardy and tolerant of my neglect. If the pineapple has gotten a bit large, I have also moved the jar outside. They will take about 2 years to produce fruit, but you can subtract some of the time they have spent in a jar. Unless you give your plant some good fertilizer and take care of your soil, your pineapple fruit may not taste great. I've had good luck with some liquid fertilizers and have produced some really sweet, albeit small, pineapples. They might have produced bigger fruits if they had been in the ground or in a larger pot. But if you are growing them just for the novelty of growing them, that's fine too. 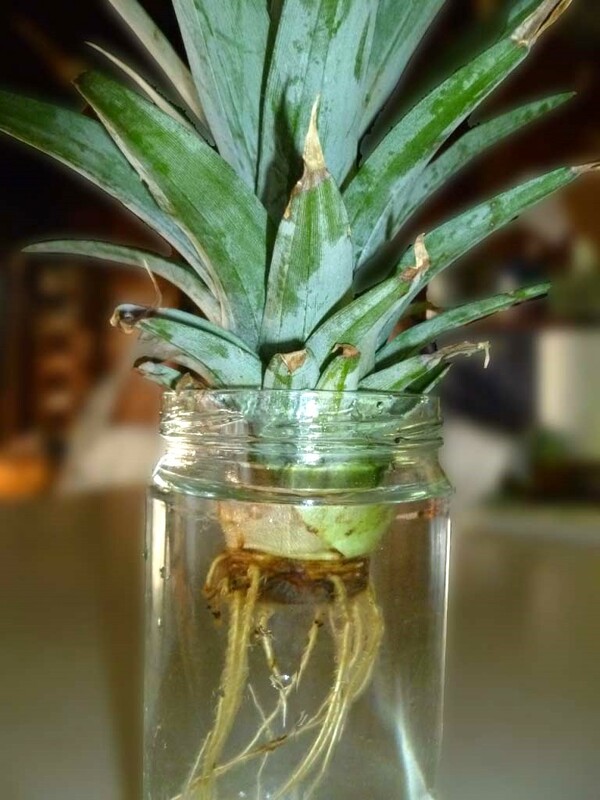 You can have an entire collection of rooting pineapple tops in jars. Feel free to name your pet pineapples. Meet Larry, Moe, and Curly. With any luck, you will grow great pineapples. It takes about 18 months from planting to grow pineapple fruit. These two plants are growing in containers on the deck. "Pineapple best success rate if from peeling ONLY a few leaves off the lower part, NOT so many until you see some of the "air roots". Let the plant DRY couple days then pot in sandy rich loam DURING HOT, GROWING SEASON. No during cool/wintry weather! That's critital. I have had 100% success rate with this guideline. Give it several hours of full sun with some shade too. Pineapple LOVES FOOD so once rooted, fertilize it. EASIEST way to grow pineapple!http://pinterest.com/pin/28...TWIST off not cut!" Dal's video is from 2009. 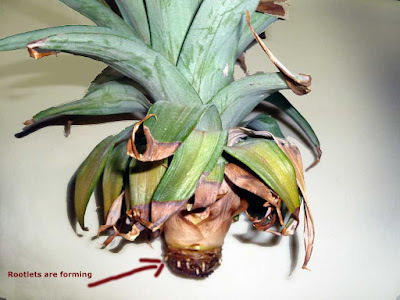 I first found out about this technique of regrowing pineapples in 2004, and it was common knowledge on Maui. If this post helped you, let me know. If you're stumbling onto this post for the first time and found it helpful and later blogged about it, I'd appreciate if your post includes a link to this site, and please also feel free to leave your link in the comments below. Aloha and mahalo (Hawaiian for thank you) for reading. If you enjoyed this post, consider subscribing to a monthly-ish email newsletter. Sign up below or visit the newsletter information page. The infamous beam over the kitchen counter. It’s very tempting to think that you can handle the termites on your own. A certain level of naiveté plus excessive DIY-itis (Do-It-Yourself-itis) is not a good combination. Since our jungalow is right over a gulch, there was no way to do the traditional termite treatment: tenting the entire house. The special poisonous gas would not be contained, since the house can’t be completely sealed. So we figured we’d try a little DIY amateur termite treatment ourselves. But, this was the beginning of the road to trouble. So, we thought we would tackle it ourselves with a bottle of Termiticide bought at Kula Hardware for about $45/bottle. Not cheap, but at least not toxic and kitchen-safe. It’s made of cedar oil, so at least it also smells good. My DH, Dear Husband, decided to knock off any loose pieces of wood. We had read that termite droppings can continue to fall even for a month after there is no termite activity, simply because they have accumulated for a while – so a good rain or a good wind can knock some of the accumulated termite debris down below. So, we thought a good idea would be to eliminate the excessive droppings and loose wood. Uh-oh. That was mistake #1. Then we sprayed the Termiticide several times overhead, all along the beam. This was taken before we knew to wear long-sleeved shirts. Mistake #2: This spray is also messy. The spray is not toxic, but it can sting a bit, so long sleeves help a lot. It got all over us, since we were under the beam. Plus it got all over the counter, the sink, the dishes. Everything had to be washed and wiped down. So, next time, we covered everything up with big plastic drop cloths and wore long-sleeve shirts. And it still managed to get all over us and everything else. So, the beam was sort of sprayed, and hopefully we got most of the wood, and hopefully it penetrated enough of the wood… so we were very hopeful. But we still had a big chewed up beam overhead. We tried using wood putty. Ha ha ha. Wood putty is so slippery and thin, that it just drips and drools down the side of the beam and leaves big white messy puddles on the floor. I guess that would be mistake #3. So, my bright or not-so-bright idea was to take a slab of modeling clay, from the local crafts store, and slather it on with a putty knife. Well, this kind of worked. It took a lot of clay, and had to be really worked into all those deep cracks and ruts. Both of us were pretty tired from applying it, and then trying to smooth it out so it didn’t look so rough and irregular. Fastest putty knife in the West. Mistake #4: We didn’t get all the termites. The beam was still ejecting termite poop projectiles. So, we ended up hacking a bit more at the beam, and spraying again. After more modeling clay, we let it dry for a few days. Then DH thought it still looked too irregular and uneven. So he sanded it. Oh lordy, take me now... White clay dust all over the kitchen. Then it got primed and painted. Phew. This little exercise only took it seemed like 3 or 4 days of Shakespearean torture with several days of pausing, waiting, cleaning, and drying in-between. Maybe I exaggerate, but it really felt that way. And that was only one beam. DH thought we should do all the beams that way. At that point, I put my foot down and said we really need to get professionals. At 20 beams overhead which take 3-4 days a beam plus drying time, that’s like a job that would take the rest of my life – at the speed I work, but only a day for real pros. Those beams do not even include all the other wood portions of the ceiling, walls and floor that are also termite infested. In retrospect, I would not have even touched that beam, nor run a finger along the surface… Once it was prodded even the slightest, it just erupted into a seething Dante-style termite inferno. If there’s nothing else you remember, don’t touch that wood! Let sleeping termite beams lie sleeping. P.S. Blog contributions and guest bloggers are welcome. If you have an interesting story to tell about termites or some other jungalow-related experience, please comment below to contact me. There are mainly two kinds of roads in rural Maui: rough and bumpy or rougher and bumpier. There are some good patches of road that have been recently resurfaced, Kaluanui Road at the top of Maliko Gulch near Makawao, and Haiku Road coming up from Hana Highway. But mostly the roads are really bad with "choke" potholes (Choke means plenty in local pidgin.) In some recent national roads report, Hawaii ranked high in having a large percentage of really bad roads. And a lot of them are on Maui. It’s not just upcountry Haiku or Kula, but even parts of South Kihei. I know someone who blew out a tire coming down Kokomo Road from Makawao. It’s easy to do, coming down hill. Hopefully, that road is next in line to get repaved. With the recent roadwork, maybe Auntie Mona of Makawao has finally gotten her message across to some politicians. At last year’s Fourth of July Parade in Makawao, she jumped up every time a candidate’s parade float or banner passed by. Since 2010 was an election year, there were a lot of candidates to confront. If she liked the person, she would give him/her a big hug and express a big mahalo (Hawaiian for thank you) loudly in front of all the spectators. Otherwise, she would accost each candidate with the same lines: “Hey, take care of us upcountry. Take care of our roads!” Actually, Auntie Mona was more entertaining than the parade itself, and I missed seeing her this year. Haiku Road getting a facelift. Now, there are some roads that are just classically rough – much of hippy Huelo, the road from Hana to Kaupo, and parts of Waihee have these rough washboard roads, best for 4 wheel drive vehicles with a high ground clearance. The newer fuel efficient cars have a lower ground clearance, which helps with fuel economy, but not with bad roads. Damaging the underside of a car can be costly – especially the catalytic converter and the crankcase which is part of the engine. The trick is to get the wheels lined up on the raised portions of the road, and on top of the rocks. Easier said then done. On the flip side, sometimes it’s good to have rough roads – it keeps those areas less developed and more rural. A lot of residents like it that way, but they have 4 wheel drive trucks. For the rest of us though, it’s better to go slowly. As they say, “Just cruise.” And watch out for potholes and rocks. Just a reminder: "Slow Down." Yesterday morning driving through Paia from Haiku, I noticed the night-blooming cereus was in bloom! There is a hedge of it that grows on the outskirts of Paia, on the mauka side of the road (Hawaiian for “mountainside”). In other words, it was growing on the same side as the Paia Community Center and the Hawaiian Protestant church. There is one long hedge that extends for about a block, and then a second, much smaller patch right by the Hawaiian church. Legend has it that the night-blooming cereus only blooms once a year, but it blooms at least two or three times a year. Perhaps more. But only for one or two days. The flowers are beautiful, extravagant in size, and in their queenly fashion, do not like the light of day. They are also fragrant. I happened to see them at 10:00 am and that was a real treat since to see them, you really have to be there at the right time. I have seen them in their wilted state, as if are having a hangover from partying too much the night before. An artist friend of mine loves this flower so much that she makes jewelry inspired by it, and she also tries to keep tabs on their blossoming time. The night-blooming cereus is a cactus that is not as common as coconuts or banana trees, but does grow widely through Hawaii. There is another section of night-blooming cereus on Haiku Road, coming up from Hana Highway, but the plant is growing high up in the pine trees. I have often speculated whether the Haiku cereus blooms at the same time as the Paia cereus, but have not been able to confirm this. There is also a famous hedge of night-blooming cereus encircling the Punahou School campus in Honolulu. According to local lore, all the night-blooming cereus in Hawaii came from this one hedge. If you are lucky, there may still be some straggler blooms to see in person. If so, traffic is pretty thick on Hana Highway, so be careful. The most accessible flowers are the ones by the Paia Hawaiian Protestant Church, since they grow right by the sidewalk. So maybe you have a little termite damage. I mean, who doesn't? It's an exceptional house that doesn't have any signs of termites. But, since you're in a jungalow, a little termite damage is often just a short precursor to a whole lot of termite damage. It's just a matter of time... termites don't sleep, do they? 1. You're always having to wipe the bottoms of your feet from all the beach sand on the floor (and you don't even go to the beach!) and then realize it's not sand, it's termite droppings.. ugh. 2. You are cooking and ask yourself, "Did I just grind some pepper in that pot?" and really, it could be little termite presents. 3. You can't use the kitchen counter or the stove to prepare food because there are too many droppings falling down and everything has to be constantly covered. 4. You can't drink from a glass of water that has been left alone for a few minutes without checking it to see if something fell in it. 5. You touch the surface of an overhead beam, and with the lightest pressure, the sides cave in as if they are rippled, and only the paint is holding the outside together. Termites don't eat paint. With a little more pressure, splinters of chewed wood fall down. 6. Your computer keyboard is not working. You are having to shake it out constantly. Eventually, you have to replace the keyboard, or worse yet, the computer. As a stop-gap measure, you tack up a sheet to the ceiling over your desk. 7. You are not even safe as you sleep, since termites as we said, don't sleep. You are thinking of setting up a tent over your bed. 8. Your roof is leaking more and more every month. The termites are eating the roof so much, that the wood has too many holes, especially along joints and areas where there are nails. There is no wood for the nail to hold on to. At this point, you really ought to take some action. The war is on: you vs. termites! Initial Signs of Termite Infestation AKA "What Is This Pile of Dark Sand?" Termites love Hawaii. In fact, they love all warm weather places, like Texas and Florida. There is no harsh winter to freeze the little buggers, so they live here happily all year round keeping you company. Unless you happen to be one of those rare people who lives high up on Haleakala Crater, where it is very cold. Or if you live in a specially built house. It may take a while to realize that your Maui Jungalow is in fact infested by termites. Initially, termites are very discrete and hardly noticeable. As times goes by, they start leaving very distinct marks of their presence. 1. Little pukas (Hawaiian for “holes”). Holes in the wood of your window frame, your furniture, the ceiling, your bed frame. Termite pukas (holes) in the window sill. More termite holes and some "tracks" or "burrows." Extended burrows through this section of wood tile in the floor. For some reason, only this particular square of wood has a lot of termite damage. 3. Little piles of termite poop. The color will vary depending on the kind of wood they’ve been eating. The poop is very firm like little grains of evenly uniform sand. It does not feel gross, since it’s basically leftover constituents of chewed up wood that couldn’t be digested. I usually see used dark or reddish termite poop but have also seen very pale yellow termite poop under pale yellow furniture. 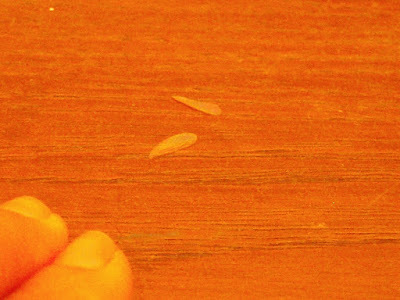 A few termite droppings on the counter. More termite droppings, both black and light, on the rug. 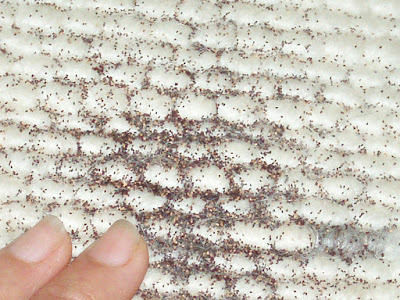 It looks like ground pepper. 4. Little translucent wings along the bathroom sink, bathtub or shower, kitchen sink, window frames, door ways, and random other places like underneath light fixtures. These are the wings of termite adolescents who have dropped their wings and are now somewhere inside a piece of yummy wood. Some termite wings on the window sill. Don't you love Maui? Enjoy your pet termites. Even the most ordinary household task can be far from mundane in a Maui Jungalow. As I opened the washing machine to load some clothes, there was a daddy long legs inside. Just minding its own business. One never knows where a bug will want to make its home. I used the machine a couple of days before, and that two day gap was enough time for a spider to move in. 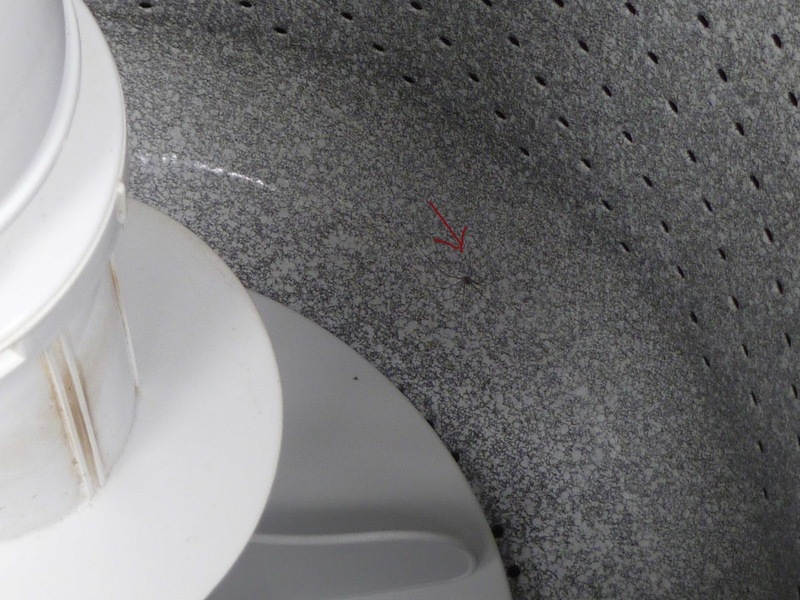 The real question is, how did a spider get into a closed washing machine? It can't just lift up the top. I explored around the ring, and to my surprise, discovered that the machine is not completely sealed. One rule of the Maui Jungalow: If there is a way, bugs will find it. After trying to scare the spider out of the machine by running some water, and watching it wobble up the wall a few inches, and fall down, I gave up. Watching it climb up and fall down over and over again was like watching paint dry. I threw a shirt over it and shook it outside, where it ran away in the grass. Then a month later, there was a daddy long legs inside the washing machine, maybe even the same one! People whose washing machines and dryers are inside their houses may not experience this problem. Perhaps I have been washing spiders all this time, and perhaps these were the two times that I actually looked closely at the inside of the machine as I was loading the clothes. Maybe I have been the great washer executioner of spiders all along. Shudder.... Anyhow, I've been checking the washing machine a lot lately. When I arrived to the Hui to volunteer that afternoon, I reached for my camera bag, and with a bad feeling in my stomach, realized I had left both camera and mini video camera at home. I spent a couple of minutes debating whether to go back and get them, which would take time away from my shift. Finally I decided to tough it out, and volunteer without trying to take pictures of everything. To focus on being present in the moment. After all, what did people do before cameras were invented? They paid attention and later recounted their experience as a story, or they wrote about it, or they drew a picture. At least a dozen times, I gritted my teeth and wished I had my camera. 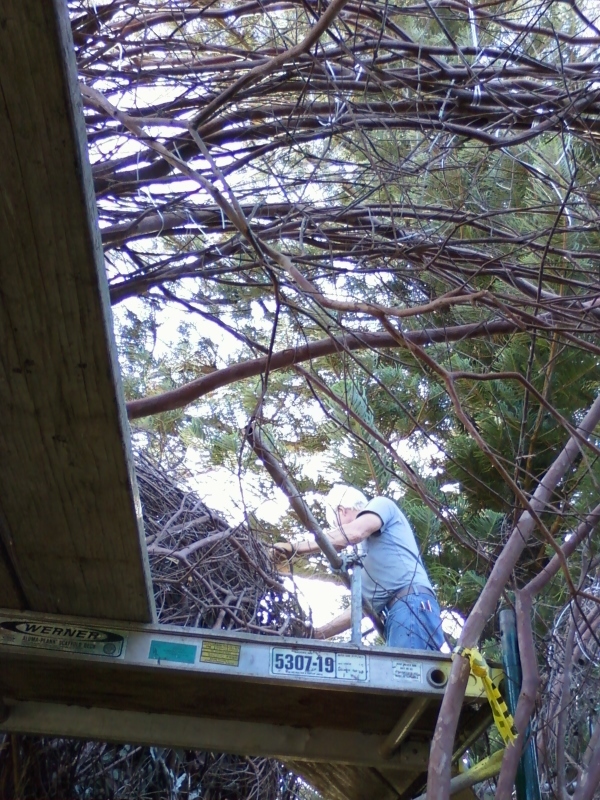 There was Patrick on the scaffolding, with two other men, moving and bending the trees. Only a few “sticks” remained standing. I am referring to the original part of the design, when three saplings – one thicker and two thinner – were inserted into the two foot deep holes. The magical moment was putting them in and at Patrick’s urging, letting them go, and realizing they would not fall over. Here was another magical moment: the last crescent with the last standing sticks was being shaped, and I did not have a camera to record it. I also remembered my architect/artist friend’s words about the magic moment when the form is being created. Oh well! I hope someone else took a video! I focused on weaving instead, joining a group forming a wall. We had to be careful not to block the doorway with the end of a branch, and push or slide a branch from one end of the wall to the other, moving it between other branches to hold it in place. Also, there was a window that was loosely defined by some white cord at the bottom and top, so we had to avoid filling it by accident. Sometimes the branch was too short, and someone would go back to the pile to hunt for longer branches. 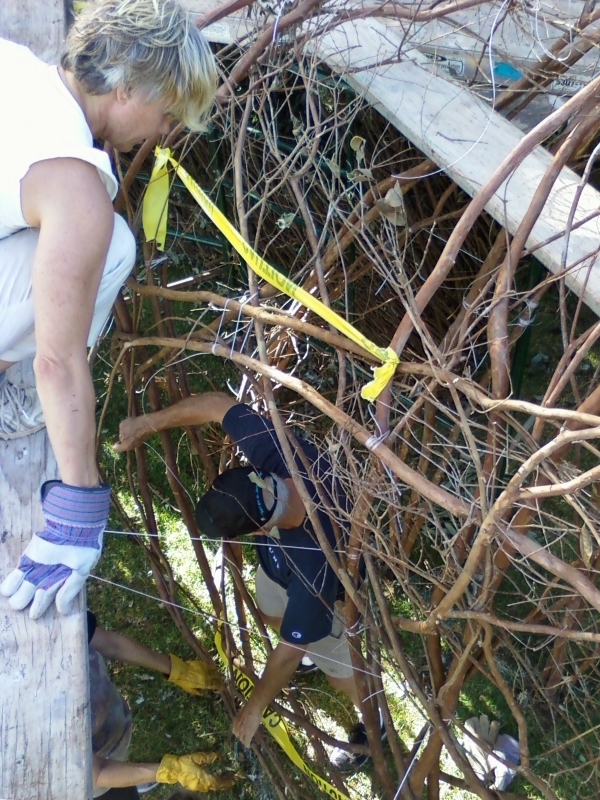 Patrick had said he wanted it to be like a “rat’s nest” with branches and sticks going in all directions. Compared to some of the other shifts, this was very relaxed. It was not the frenzy of collecting the saplings and branches, and not the rush to drill holes and get the trees stripped of leaves. 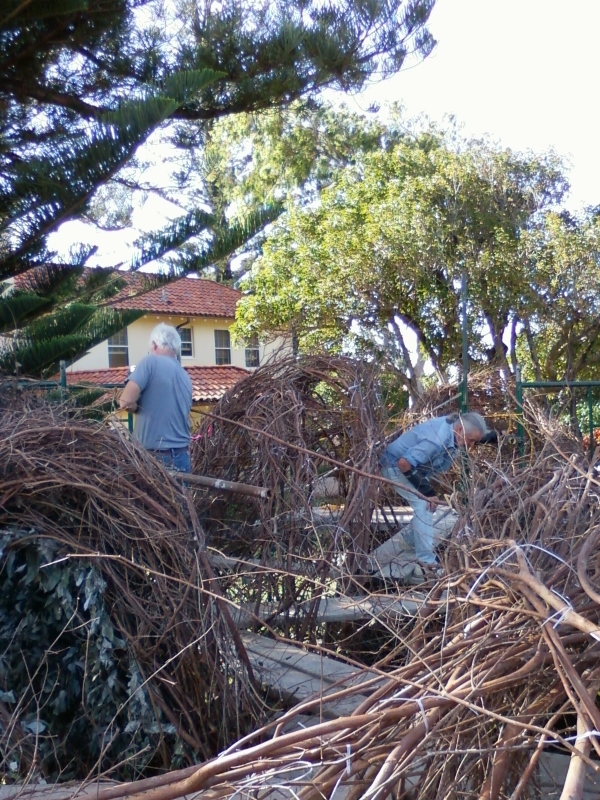 Volunteers worked at their own pace, with little direct supervision. Decisions were made collectively, and changed just as often. Should we put the branch through this hole or that one? Do you want it angled this way or that way? Just as often, we pulled back the stick, or “backed up” to give the puller a chance to pull the stick through a particular opening that had been overshot. Patrick also pushed the front and back of each wall together and then tied some of the branches to keep the walls compressed. This was another attempt to keep maximize the use of the remaining materials. By compressing the walls, the gaps are not as big, and the walls require less sticks. 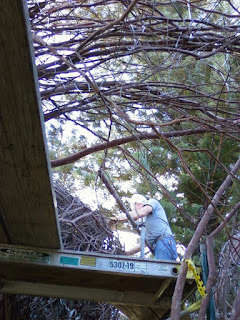 At the end of the afternoon, Patrick was up on the scaffolding again, pushing more sticks to round out the ceiling. I stood on the scaffolding and looked over the hills of the sculpture, dotted with round and teardrop-shaped openings. I will miss the scaffolding when it’s gone. Another volunteer who has been there every day since the start of building said that they had just moved the scaffolding all around that morning so they could finish the last bending of the “standing sticks.” I felt a stab of envy that he had been able to spend time at the project every day. Meanwhile a photographer showed up with the sun close to the horizon and started taking pictures with a monster camera. Lucky him, with his camera. My last twinge of sadness was hearing Patrick say that after a few years, Mother Nature takes over. These sculptures are not that permanent. The thought had flickered in my mind earlier that Hawaii is very harsh to wood – we have termites, mold, acidic rain, and general entropy. But I had shrugged it off, since the sculpture is made of very hard strawberry guava and eucalyptus, not favorites of termites. I asked Patrick, “So, do you come back and touch it up?” thinking this would be fun to have Patrick back again. 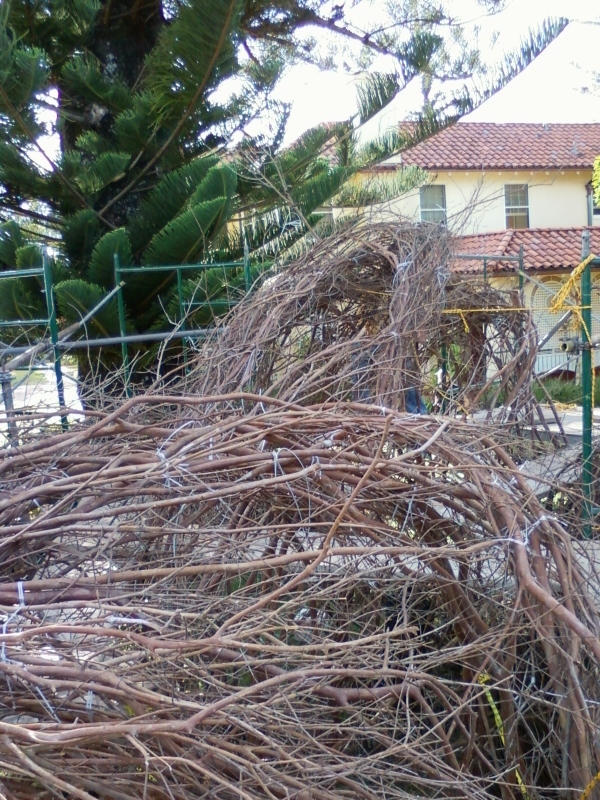 He said no, he generally dismantles them before Mother Nature has her way. They are pretty rough by then. 1) My cell phone pictures aren't that bad - the phone just doesn't do close-ups that well. 2) Cell phone sized pics fit nicely side by side. Final thought - the sculpture is not finished...even stopping by for a short time during the process is wonderful, even if you forget your camera. There is also a blessing and opening ceremony at the Hui on Friday, September 23rd from 5 pm to 7 pm.